If choosing the cannabis strain that both suits your taste and grow op is proving to be trickier than you anticipated, don't worry. This blog is all about the latest innovation in the search for the perfect cannabis: the Strain Finder. Royal Queen Seeds can now play cannabis match-maker for growers and the seeds they desire most. WHAT IS THE CANNABIS STRAIN FINDER? Finding the ideal strain can be quite challenging these days. With so many excellent weed strains, medical marijuana strains, autoflowering varieties, and new hybrids constantly being developed it, can be difficult to select cannabis seeds. Every seed company is vying for your attention and your hard earned cash. But only Royal Queen Seeds is providing the tools to assist growers. Not only is the RQS catalogue packed with high-grade feminised seeds, but the RQS blog is also full of useful cannabis info. Now the website just got even more grower friendly with Strain Finder. Strain Finder is the advanced but easy to use cannabis search tool that has been missing from the web. Finding the right kind of seeds just got a whole lot simpler for ordinary decent growers. Next time you are browsing the RQS website for cannabis seeds, click on the Strain Filter bar. First, what type of grower are you? Indoor or outdoor, tick the box that applies. Just below you can get into the specifics of precisely what genetics you want in your next cannabis crop. Select attributes, characteristics and traits across 7 key parameters for all cannabis cultivators. Yield, Height, Flowering (duration), THC, CBD, Type (subspecies Sativa/Indica/Hybrid), and Climate are all included. Check the box that suits your taste and grow style from the suite of options for each category. Finally, organise the search according to your top priority in the Sort By section and click Apply to run the search. The results will be customised to suit you and your grow op. Choose the RQS strain that meets all your requirements. Now is the time to be selfish - after all, the bud will either be your medicine or recreational herbs at the end of the day. Begin your next grow with confidence in your choice of cannabis seeds with Strain Finder. WHAT ARE THE ADVANTAGES FOR GROWERS? Strain Finder allows the grower to dial in the most important component of any cannabis grow - the genetics. Regardless of your level of cultivation experience or grow style, the RQS Strain Finder is the fastest way to find the cannabis seeds tailored to suit you. 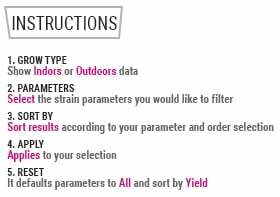 If you’re looking for a niche variety or something new that ticks all the right boxes, Strain Finder is the search tool you need. Haven’t got the time to spend sifting through reviews and reports on cannabis strains and need hard data in a hurry? Strain Finder will be your invaluable digital assistant. Search results will be nothing but the closest matches to your custom checklist. Make an informed choice for your next marijuana crop in minutes with Strain Finder. You deserve the very best cannabis. With Strain Finder, you can’t miss.